This orange bundt cake recipe came about because I’ve been craving oranges like crazy this freezing cold winter and have been purchasing navel oranges non-stop from the grocery store. 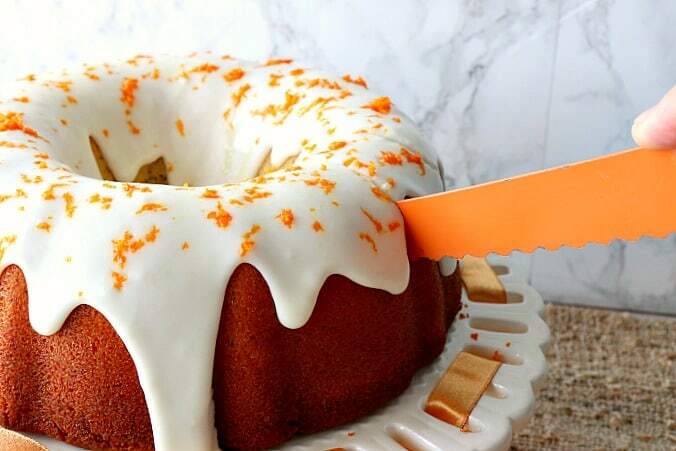 But that’s not the only reason this incredibly delicious citrus bundt cake came about. You see, along with all the navel oranges I’ve been craving, I’ve also been re-binge-watching the entire series (yep, all five seasons) of the Great British Bake Off which always puts me in the mood to bake like mad! 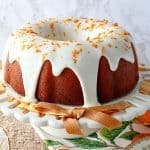 The combination of those two things led me to create this recipe for Best Orange Bundt Cake with Banana and Poppy Seeds. So if you’re ready…On your marks! Get set! BAKE!! 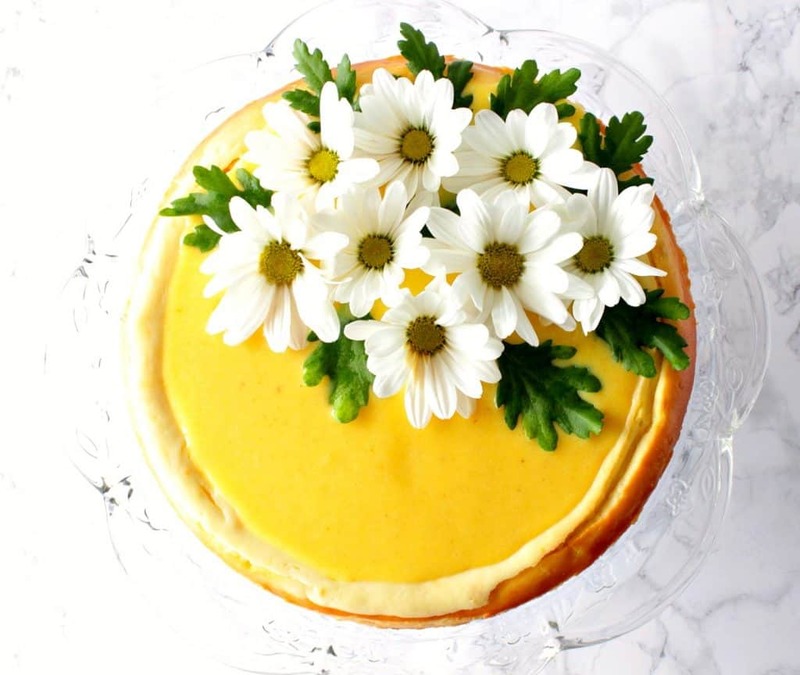 **Please Note – The printable recipe card with detailed instructions, complete ingredient measurements, and nutritional information for making the best scratch orange cake is available near the end of this post. 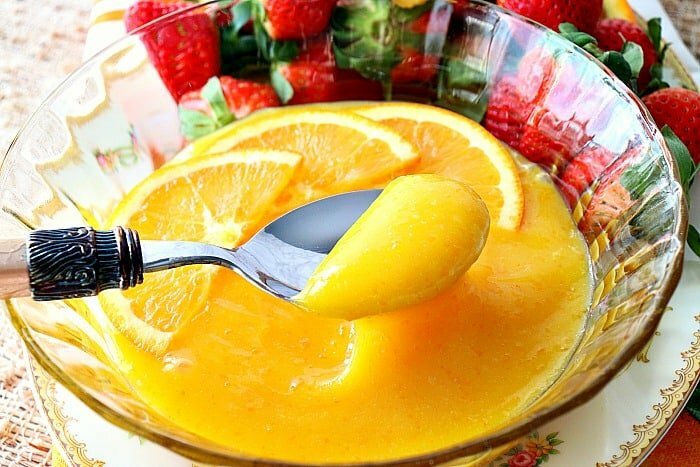 Find my recipe for making Homemade Orange Curd HERE. What is the purpose of baking with buttermilk as opposed to regular milk? Buttermilk (or a buttermilk substitute) ensures a moist and tender bake by breaking down tough gluten strands in a batter. Baking with buttermilk also adds a slight tartness to baked good which is very pleasant to the palate in contrast to many sweet, rich desserts. What’s that? You don’t have buttermilk in the fridge but you have all the other ingredients on hand to make this citrus pound cake! Now what? NO PROBLEM! Did you know you can make your own buttermilk at home? Add 1 tablespoon of white or cider vinegar (lemon juice can also be used) per every cup of regular milk. Allow the mixture to sit for at least 5 minutes. Replaces store-bought regular buttermilk for all your favorite baking recipes. If this cake is so moist, does it need a topping or icing? No, not really. With the addition of the buttermilk and the mashed banana in the batter, a topping or icing isn’t actually necessary. 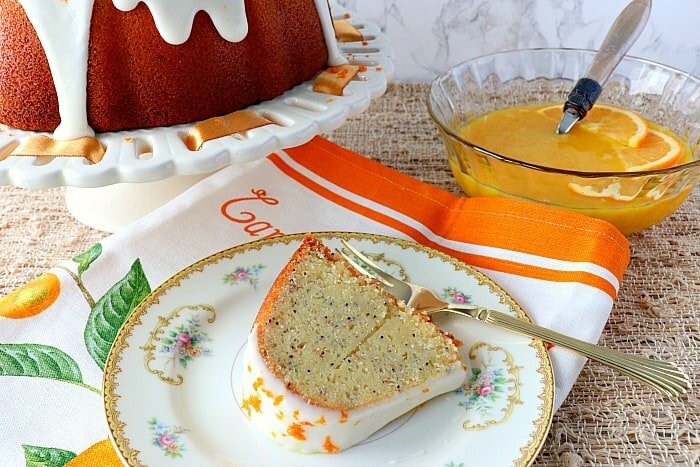 However, if you’re looking to really guild-the-lily, and take this citrus bundt cake over the top in regards to flavor and impressive presentation, then homemade orange curd (along with an orange icing glaze) is the perfect sweet and sour topping for this homebaked scratch orange cake you won’t soon forget. Why not guild-the-lily with fresh homemade orange curd drizzled over the top? Add the buttermilk into a medium bowl. OR (if making homemade buttermilk) stir two tablespoons of vinegar into 2 cups of milk. Set aside. Add the zest of two oranges to the buttermilk along with fresh orange juice, and orange extract (optional). Place two sticks of softened butter in the bowl of a stand mixer and cream together with the granulated sugar using the paddle attachment. Mash one overly ripe banana and blend it with the creamed butter and sugar mixture. Add the buttermilk and orange zest mixture to the bowl and blend until completely combined. Working in batches, add the dry ingredients into the wet ingredients in the mixing bowl until all the flour has been incorporated. Stir the poppy seeds into the batter and blend to combine. Incorporate the eggs, one at a time, into the batter blending well after each addition. Prepare a bundt pan by spraying liberally with baking spray. Place the bundt pan on a baking sheet and bake in a preheated oven for 75-90 minutes, or until a toothpick inserted in the center comes out clean. Allow the cake to cool on a baking rack for 30 minutes, and then invert the cake out onto a cake plate to cool completely. To make the orange glaze, mix the confectioners sugar with fresh orange juice. 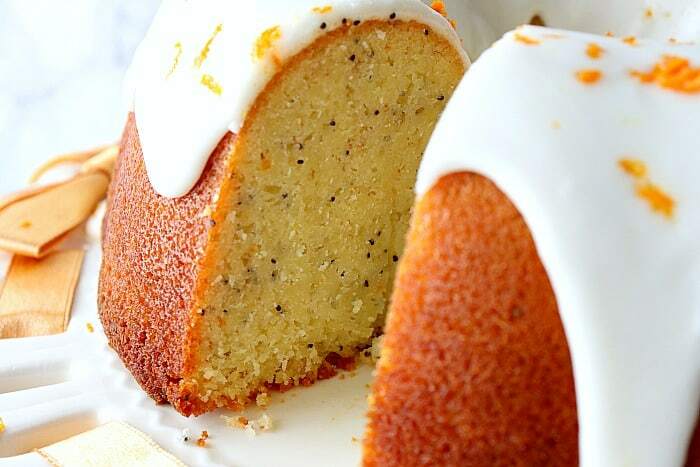 Top the cake with fresh orange zest while the icing still wet. 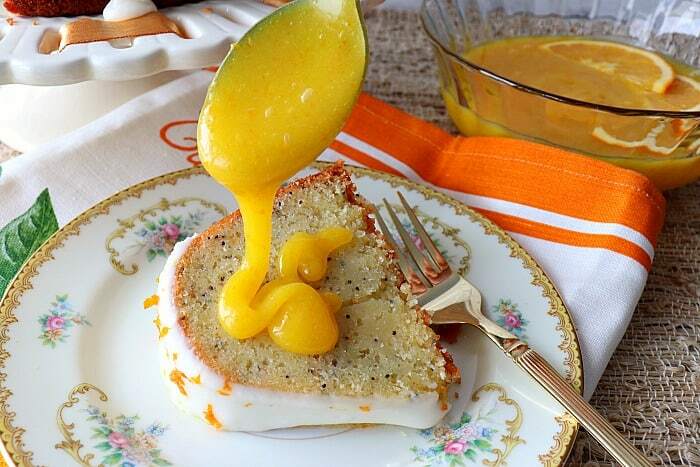 Spoon homemade orange curd over cake slices before serving, if desired. 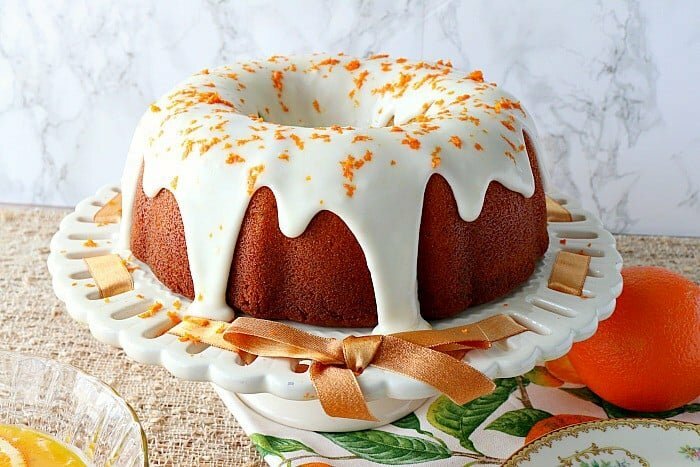 **The following affiliate links are some suggested products I’ve chosen that will aid you in the making and serving of this recipe for moist scratch orange bundt cake if desired. Below is the printable recipe card for today’s homemade orange bundt cake. Deliciously moist and flavorful. 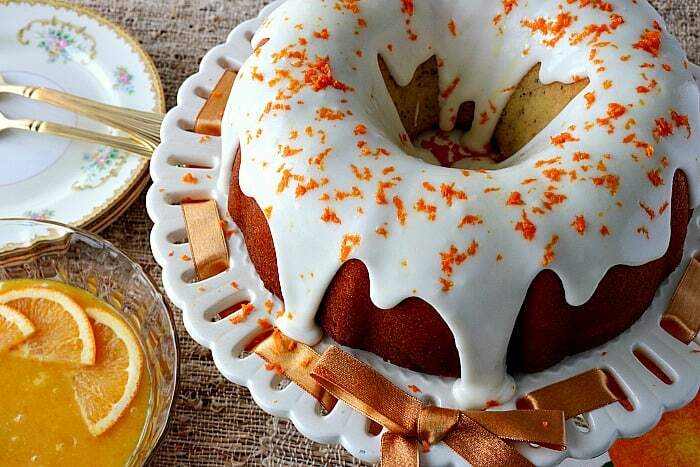 This orange bundt cake is as impressive to serve as it is to eat! In a small bowl, whisk together the buttermilk, orange zest, orange juice, and orange extract (optional). Set aside. Mash the banana with a fork in a small bowl. Set aside. In a large bowl of a stand mixer (or use a hand mixer) cream together the softened butter and sugar until light and fluffy. Add the mashed banana to the butter and sugar mixture and blend to combine. Add the buttermilk mixture to the mixing bowl and blend on low speed to combine. Incorporate the flour mixture (by thirds) into the mixing bowl, blending after each addition. Add the eggs (one at a time) into the batter blending well after each addition. Stir in the poppy seeds until well distributed throughout the batter. Pour the batter into a bundt pan which has been liberally sprayed with baking spray. Place the cake pan on a baking sheet and bake in a preheated oven for 75-90 minutes, or until a skewer inserted in the center of the cake comes out clean. Cool the cake on a baking rack for 30 minutes and then turn the cake out onto a serving plate and allow to cool completely before icing. In a medium bowl whisk together the confectioner's sugar and fresh orange juice until the icing is thick, but still falls off the whisk pretty freely. *Note - if the icing is too thick add a touch more juice. If the icing is too thin, add a touch more confectioner's sugar. Liberally ice the top of the cooled orange bundt cake allowing the icing to trail down the sides of the cake. Garnish the top of the cake with fresh orange zest (if desired) while the icing is still wet. bundt pan, baking spray, stand mixer or hand mixer, large bowls, small bowls, whisk, spatula, measuring spoons, measuring cups, baking sheet, cooling rack, cake plate, orange juicer (optional), microplane (for zesting oranges), fork (to mash banana). Cover and refrigerate the cake for up to 3 days. 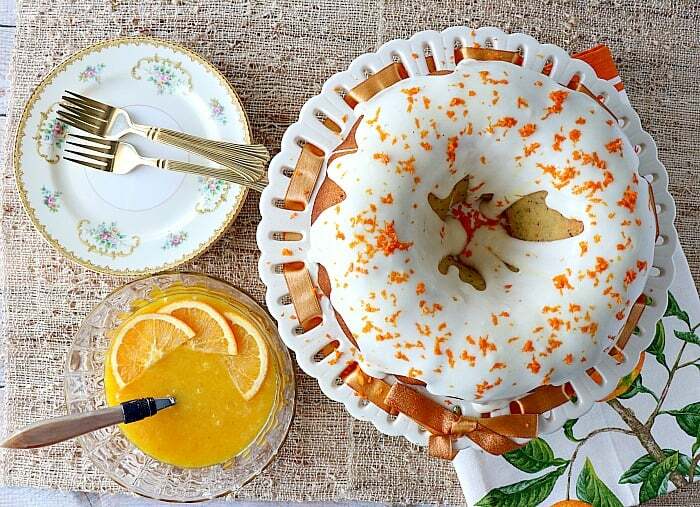 I sincerely hope you’ve enjoyed today’s recipe for this delicious scratch orange bundt cake that tastes like sunshine as much as I’ve enjoyed bringing it to you! Looks delicious! Love all the beautiful pictures, thank you! This cake is delicious! 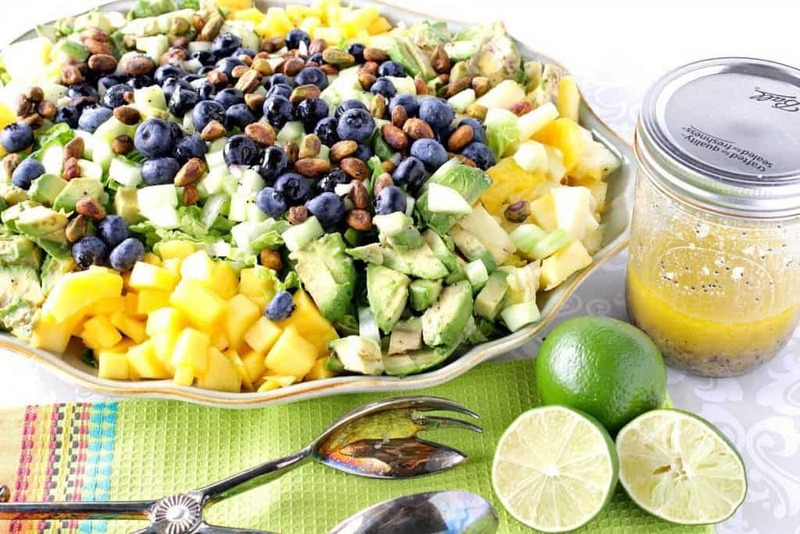 The perfect way to bring a little sunshine to this dreary winter. Thank you. I’m glad you think so!! This was just the cake my family needed to bring a little “sunshine” into our dreary winter days. Such a tender cake, easy to make and incredibly delicious. I’m adding this recipe gem to my files to make over and over again. So nice to hear, Joanie! Thank you. I’m glad you enjoyed it! The cake is so amazing. I’m baking it up to share with some friends at brunch this weekend. It looks incredible. I’m sure your friends will enjoy it, Lisa! Thank you! This cake looks so delicious. Can’t wait to make it. I have a question, however. I received around 20 lbs of blood oranges I’m working my way through, or giving to friends and family, LOL and am wondering if that would be a good sub for regular oranges in this recipe. I know the color of the cake and curd will be different, but any other concerns? I’m thinking not, but just checking to be sure. Great question and you’re so lucky to have received so many blood oranges. They’ll work just fine in this recipe. The only thing that may affect the taste (from the written navel orange) is that blood oranges have a slight tartness whereas navel oranges are sweeter. That said, I don’t think the difference is enough to make the cake (or curd) too tart or unpalatable. I believe the blood oranges will be delicious substitution in this recipe and the color will be spectacular…especially the curd. If you remember I’d love to know how this worked out for you, so please let me know. These blood oranges seem to be on the sweet side so I’m gonna go for it. Stand by! Well, I ended up making this and the curd. All came out well. The glaze is a bright pink from the blood oranges and the curd is more a deep, rich, red almost like an iced tea color because of cooking it. I’ll get a pic and post it over on the Facebook page.